Lately, I’ve been sliding towards veganism. For a life-long vegetarian, this is not really that much of an adjustment; I’ve never really liked milk and have always been disturbed by eggs in most preparations. 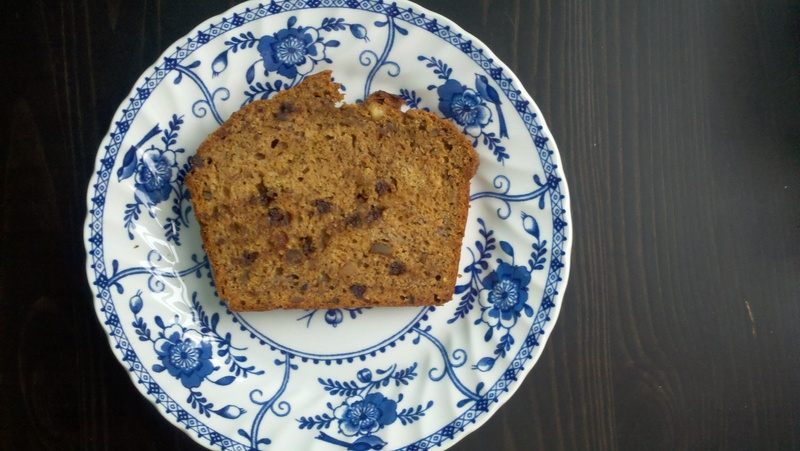 I received The Veganomicon as a gift last Christmas but only just discovered how wonderful the banana bread recipe is; it’s exactly what I’ve been looking for through many failures of too-heavy, greasy loaves and strangely-textured, healthy ones. It rose beautifully and the texture is just right (I think that the molasses helps). Of course, I went and un-veganed it with some mini chocolate chips that were lurking in my pantry. I’m getting there. I’m reluctant to post the recipe since I barely adapted it at all, but this version from Joy the Baker seems like another adaptation of the basic recipe. I used 1/4 c applesauce instead of pineapple, 2 T molasses instead of the extra 2 T sugar, toasted walnuts and chocolate chips instead of coconut, nutmeg instead of allspice and ginger, and, for once, all white flour instead of whole wheat–I’ve decided just to go for it when it comes to banana bread. I’m beginning to think that, with baked goods, there’s no reason NOT to go vegan…Unless you’re putting cheddar cheese on your cupcake. i have to say, cheddar cheese on a cupcake sounds kind of awesome.